In the eyes of many, Will Hoge is one of those stereotpyical, perceived overnight success stories that Zane Williams refers to in his hit single. Yet, Hoge has been a roots rock-soul revivalist with a troubadour’s lyrical heart for well over a decade. His first release came out in 1997, and he’s been a highway roaddog performing intense rock n’ roll sets at dive bars and theaters pretty much ever since. He’s been on the cusp of mainstream breakthroughs many times, still it wasn’t until Eli Young Band covered Hoge’s remarkable, semi-autobiographical “Even If It Breaks Your Heart” from his 2009 album The Wreckage that he truly started receiving the attention his talents truly deserved. 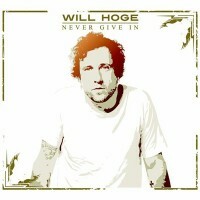 Despite a misfire with 2012’s politically-charged Modern American Protest Music, Hoge’s discography is rather seamless. Each effort is a strong collection of southern gospel-rooted soul and R&B married with heartland rock. I’m not the first one that’s compared Hoge’s style (both in songwriting and performing) to that of Springsteen, and Never Give In is the clearest example of that analogy yet. Hoge kicks things off with “A Different Man”, a Patrick Davis tune that joyously expounds the love a man feels for the woman that saved him without ever straggling over to cliche. The title track possesses the tightest melody on the record and on the surface appears to be a declaration of love between a man and woman. However, it could just as easily be unveiled as Hoge’s message to himself on 15 years of music industry scars that have left him standing at the top of the mountain due to talent and tenacity. “This Time Around” channels Otis Redding musically and Merle Haggard lyrically, which is a combination that is undeniably pleasing. “Home Is Where The Heart Breaks” is the saddest country song you’ve ever heard delivered in the manner of an uptempo rock song. The country cred is ratcheted up on “Daddy Was a Gambling Man” which features the tale of a family in financial and emotional ruin soaked in booze and steel guitar. Ripples of B3 organs mingle with big guitars all boosted by the most soulful backing vocals this side of Stax Records in the 1960’s. This album distills Hoge’s best musical talents into catchy hooks and lyrically-driven morsels of genuineness. Never Give In is a culmination sixteen years in the making. Will Hoge has grown into the artist that many have always known he was, it just took some Grammy-nominated songwriting plaudits to truly open everyone’s ears. This album is the perfect melding of what makes Will Hoge brilliant and firmly establishes him as a modern American master. Additionally, there is one thing that’s clearer than ever: Will Hoge doesn’t need country music, but country music needs Will Hoge. You didn’t like Modern American Protest Music? Surprised. For the music or the politics?